In view of the coming Flood and Conflagration the author of “Powieki” (“Eyelids”) will offer a few final remarks with his fading voice. Recommended for people with kind and pensive nature. Espen Aarseth’s Cybertext is an exceptionally original book that is crucial for new media researchers. Showing – despite a common belief – that a medium does not determine the nature of a literary work, the author analyzes the structure of word compositions, exploring those that can be constructed or generated. It is a vast group – Aarseth takes a closer look at the Chinese Book of Changes, Composition No. 1, classic cyber texts such as “afternoon, a story” (“popołudnie, pewna historia”), adventure games and MUDs – defined by the implementation of cybertext, ergodicity, narration and schemer categories. The book also explores problems of ideology and politics: games and a critical reflection on them. This is a presentation of the poem “O przyjdź jesienią” in a spatial, modular and multi-linear form. Individual parts of a literary work that has been purposefully taken apart are extracted from stickers containing QR codes placed around the reader. Rhyming fragments of the poem randomly regulate a non-linear reading. This exercise encourages the present-day reader to return to sources of versification in order to pose a few questions about the state of 21st-century poetry broadened by technological prostheses. A set of tonic remakes of Polish poetry classics created with the usage of search engines suggestions. In crucial places of the poem, at the beginning of verse or after the caesura, – instead of the original text – the reader will find phrases typed in brownser window by milions of Polish users. Created in such manner remix is an eye-opening, funny, suprising in it’s poetic and a very actual in terms of content clash of the original and the collective knowlage of language of Internet users. Who can be the author of a literary work? To what extent does a machine understand what it is writing and to what extent does the significance of a text result from the meaning assigned to it by the reader? During this workshop, participants will be introduced to rules of making algorithmic generators of literary texts, while focusing on the creation of a logically consistent story. All interested in taking part in this free text generation workshop are asked to contact the organizers via e-mail: ewelina.sasin@ha.art.pl. Applications will be accepted until September 30th, 2014. The number of spaces is limited. Participants will need to bring either a laptop or a notebook and something to write with. People who choose to use a computer during the workshop should know HTML and have an editor of this language installed on their device. Those who decide to use paper and pen can optionally bring dice. Texts created during the workshop will be collected and combined in a collaborative generator, and then presented to the participants afterwards. Both programming and adding a text to the collaborative generator are optional. Media arts shows give readers and artists social opportunities to realize new aspects of art. This workshop will explain how to build a show of any scale, from a small installation to a large, international show with many computer stations and a cohort of visiting artist. Translating text generators is a process that demands engagement with code and language. Any sort of translation demands close attention to the source work, but when a text generator is the work, translators must also consider matters of platform, the way code is written, and how it functions, all of which are important aspects of this type of work. People can’t get enough of stories – we’re always seeking to re-experience them, in new different forms and versions. Myths have been transformed and rehashed between religion, folklore, and popular narrative. It’s typical to see the play, read the book, watch the film, and now, play the game. Each medium will appropriate a story based on what each medium can do best. This exhibit focuses on literary adaptations to the new medium of the videogame, ones that come from classical theater texts (by Sophocles and William Shakespeare) as well as novels (by F. Scott Fitzgerald and Douglas Adams). This exhibition of Jarodzki’s drawings at Bomba Social Club consists of excerpts from Korporacja Ha!art’s most recent publication, “Kompletna historia wszechświata ze szczególnym uwzględnieniem Polski” (“A Complete History of the Universe, with Particular Emphasis on Poland”). It presents the observations of a man who appeared in this country by pure chance over 56 years ago and has remained here ever since. Some of the observations are quite funny, while others – not at all. “Microtones” is an audio performance based on two volumes of Zenon Fajfer’s poetry “dwadzieścia jeden liter/ten letters” (Korporacja Ha!art, 2011) and “Powieki” (“Eyelids”) (FORMA Publishing House, Henryk Bereza Literature Foundation, 2013). A cyberhobo performance seasoned with ZUSWAVE and POORWAVE, with endnotes suspended in outer space. “The Mother Matrix” (“Macierz”) is a reconstruction of the Slavic myth about the creation of the world. The Big Bang gave rise to gods, who then created life on earth. We participate in a journey through a land of symbols up to the moment when a soul is transformed into matter. The use of an innovative, original animation technique constructs visionary, psychedelic scenery. The history of experimental poetry in the Ukraine is full of surprises. Ukrainian literature is ripe with many forms of poetry that are uncommon in other countries. I will try to briefly describe the Ukrainian roots of the poetic technique I use in my works, as well as have a look at parallel – or rather “coordinate” forms: baroque, poetry from the turn of 19th and 20th century, inter- and postwar poetic forms, as well as modern works. The Ukraine has always longed for autonomous, “history-free” literature. And because I favor this type of literature – I’m going to dedicate my lecture to it. This is a discussion on generative literature, its paradoxical relations with the demoscene and prospects for development, and the premiere of the 46th issue of Ha!art quarterly, with the participation of Nick Montfort, Jakub Jagiełło and Jakub Noniewicz. The discussion will be led both in Polish and English. See how artists create participatory environments where ordinary people can make new stories. Discover new interfaces for human/computer story making, and why digital reveals new occasions for human “liveness” face-to-face! Multilinear and multilink, suspended between individual talent and collective inspiration; kept in check by one title and one topic but falling into competing ideas and manifold ambitions – this collaborative novel,­ written by Ha!art readers over the course of a couple of months, is an experiment with a result yet to reveal itself, one which has a chance to shed new light on the idea of a narration written collaboratively and with the implementationof the Web as a rhetorical tool and platform for communication. What are the results of this risky endeavor so far? What do the authors think? Is the collaborative novel even possible? With the help of graphic documentations of the project , the moderators and authors will express their opinions on the project and invite the participants to further discussion. The Laboratory of the Debut is a new Korporacja Ha!art initiative which aims to help young, emerging writers. The primary project within the framework of this initiative is the creation of an anthology of urban legends. During the meeting, authors cooperating with the Laboratory (Katarzyna Gondek, Adam Miklasz, Maciej Bobula, Aleksander Przybylski and Michal Zantman) will present their first drafts for the book, the premiere of which is planned for December 2014. This meeting will be a presentation of the most significant conclusions contained in the report “Literatura polska po 1989 roku w świetle teorii Pierre’a Bourdieu” (“Polish Literature after 1989 in Light of Pierre Bourdieu’s Theory”). A short introduction shedding light on the present-day condition of literature in Poland will serve as a starting point for a discussion of the situation of writers in our country, especially those who are just beginning their careers. A meeting with this year’s debutantes – Michał R. Wiśniewski (“Jetlag”) and Joanna Dziwak (“Gry Losowe”) will be a starting point for the discussion about the condition of contemporary literature, with particular emphasis put on the institution of debuting in Poland. In an interview with Sławomir Shuty, the authors will recount how and for what reasons one becomes a writer. The first stories in the book “Neither, Nor” (“Nie to/Nie tamto”) present the stylized world of an Anglo-Saxon ideal reality – hair combed back, gentle smiles, shooting ranges in open-air parks. A similar atmosphere can be found in some of Nick Cave’s songs. And just like in Cave’s ballads, at a certain moment this world starts to tremble. 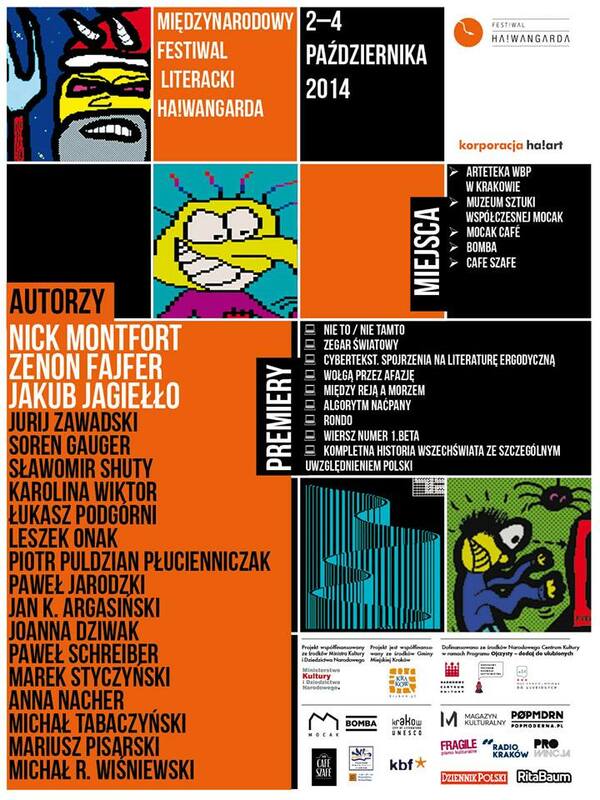 During this workshop there will be a presentation of a multimedia hypertext novel by Jakub Jagiełło, in which the author has incorporated software solutions allowing him to monitor how people read his novel and, on the basis of this feedback, to make changes and adjust the text to readers. “Round” is one of Montfort’s latest text generators. The author presented it at this year’s Electronic Literature Organization Conference. The building material of the produced text consists of nine rows of legible text and line break commands. Like its English prototype, the Polish “Rondo” computes the digits of π, and then generates a corresponding string of characters. “Rondo,” like calculations of the numbers in π and the musical work of the same name, never ends; there is no final line or internally specified condition that will cause the program to stop. Theoretically, however, if we consider that increasingly more steps become necessary in order to determine the next digit of π, we realize that the computer is visibly slowing down and finally overheating. “World Clock”tells of 1,440 incidents that take place around the world at each minute of a day. The novel was inspired byStanislawLem’s essay “Jedna minuta” (“One Human Minute”) in a collection with a very significant title, “Biblioteka XXI wieku” (“Library of the 21st Century”), as well as Harry Mathews’s “The Chronogramfor 1998” (“Chronostych na 1998 rok”). Based on Lem’s concept, “World Clock” by Nick Montfort focuses on the industrial approach to time, describing the banality experienced by people all over the world. The text was generated with Python code, with the usage of an external time zone application. This program, after a couple of more serious glitches, displays classic texts that are available in the database. The user can choose between several ways of getting drunk or stoned with the algorithm: beer, vodka, pot or LSD. The works undergo graphic, morphological and syntactic deformation. The type of stimulant and its dose has an influence on the degree of distortion of the original text. This is a digital embezzlement of Bruno Schulz’s short story “Sierpień” (“August”). Some of the nouns have been cut out of Schulz’s text and randomly replaced with words taken from the book “Polski Fiat 125p. Budowa. Eksploatacja. Naprawa” (“Polish Fiat 125p: Construction, Use, Repair”). Through the usage of declination, person and grammatical gender, the algorithm matches a randomly selected word to the syntax of a sentence. In this way, the text’s final form is controlled entirely by pure chance. This text, representing phonetic poetry, has a subtle semantic shade and a fragile sense of the shifting of significance and transformation – which is the goal for the creators of the ZSUF group, a collective that Zawadskij collaborates with (even the name of the group was derived from the (Polish)word ”zsuw”). “ae” – the poem the author will present – is a multidimensional poetic structure which aims to have a profound impact on the reader’s consciousness, through reference to even the least obvious ways of understanding the meaning of the basic elements of language. Espen Aarseth. Hypertext and digital media theoretician and researcher, professor at IT University of Copenhagen, editor-in-chief of “Game Studies” Magazine. Author of the classic, though still revolutionary, book dedicated to the theory of digital literature – Cybertext. Perspectives on Ergodic Literature (Baltimore 1997, pol edit. Cybertekst. Spojrzenie na literaturę ergodyczną, Kraków–Bydgoszcz, 2014). His essay Hyper/Text/Theory was published in a fundamental textbook The New Media Reader (Boston 2003). Jan K. Argasiński.He has a degree in Cultural Studies (media expert), he is doctoral student at the Institute of Audiovisual Studies. He deals with software studies: in other words, what interests him most are the relations between culture and software. Kathi Inman Berens. Fulbright Scholar at the University of Bergen’s Digital Culture Research Group. Kathi Inman Berens curates and researches electronic literature. She’s installed shows at the U.S. Library of Congress, the University of Wisconsin-Milwaukee, and two annual conventions at the Modern Language Association. Her scholarship focuses on electronic literature reception and its impact on literary canon formation. A lecturer at the University of Southern California’s Annenberg School of Communication, Kathi is a member of the Annenberg Innovation Lab’s Research Council. She won in 2012 an IBM Faculty Award for her work in virtual classroom software. Tomasz Bochniak. A graduate of the Faculty of Intermedia at The Academy of Fine Arts in Cracow. He has a bachelor’s degree in Animation at Professor Krzysztof Kiwierski’s Animation Studio. He is the director and animator of:Macierz (prod. SFP), Cargo (prod. Ha!art still in production), Bzduropis (prod. ASP Kraków 2013), Trip (prod. Ha!art 2012), Aladdin Killers Conversation with intellectuals (videoclip 2012), Spadam (videoclip of Abradab band 2011), Starożytne piękno (prod. WSF 2010). Editor of: Milion Szczęśliwych Ludzi (prod. HBO 2011 – Festival of Documentaries “Nurt”– Award of the Polish Filmmakers Association) and Przyjęcie (prod. Studio Munka 2010 – Londyn Open City Docs – Special Jury Recognition. Joanna Dziwak. Born in 1986 in Lubelszczyzna. She is an author of sad poems about growing up and a creator of the facebook site Hipsterski maoizm. She currently lives in Cracow. She is very modest in face-to-face contact, and very cutting in her literary works. Zenon Fajfer. A renaissance man of letters, the godfather of liberature. Soren Gauger. One of the finest translators of Polish literature into English (widely praised for translations of Jasieński, Ficowski, and Jagielski), writer, essayist. A Canadian who has been living in Cracow, Poland for 15 years. He studied at Simon Frasier University in Vancouver and the Jagiellonian University in Cracow. Gauger has published in journals in US, Canada and Europe. So far he has published two collections of short stories in English – Hymns to Millionaires (2004) and Quatre Regards sur l’Efant Jesus (2004), which were well received by the international critics. For a couple of years he has also been writing in Polish; Soren’s short stories were published in “Rita Baum” and “Ha!art”. The novel Nor, Neither is going to be his debut in Polish. Scotia Gilroy. A literary translator, writer and musician from Vancouver, Canada, currently living in Krakow, Poland. She works as a Polish-English translator for numerous cultural institutions and literary publishers in Poland, and edits Ad Americam, the Jagiellonian University’s annual journal of American studies. Her fiction has appeared in the anthology Warsaw Tales, the Berlin-based journal “Bordercrossing Berlin” and the “Krakow Post”. Monika Górska-Olesińska. A media expert, an associated professor at the Theater, Film and New Media Department of Opole University. Her research is focused on cyberculture, electronic literature and digital poetry. The author of Słowo w sieci. Elektroniczne dyskursy monograph (Opole 2009) and editor of the article collections Od liberatury do e-literatury 2. Remiksy, remediacje, redefinicje (opole 2012). Her works have been published in “Przegląd Kulturoznawczy”, “Kultura Współczesna”, “Kultura Popularna”, “Ha!art” i “Techsty”. Jakub Bogusław Jagiełło. He was born in Gorzów Wielkopolski and currently lives in Poznań. Professionally he’s a programmer who graduated in Computer Science at Poznań University of Technology. Jagiełło experiments with cyber medium, non-standard forms of narration (especially with hypertext and generative literature), logic of mathematics, stop-motion animation, artificaial intelligence and calligraphy. Katarzyna Janota. Graphic designer, illustrator, animator. Paweł Jarodzki. He lives in Wrocław. In 1984 he graduated from Wrocław Academy of Fine Arts, where he currently works as a professor. He is a BWA Wrocław curator, a critical writer, a painter and an illustrator. As a student, he set up the group Luxus with friends. The group organizes exhibitions, publishes its own magazine and tries to organize its surroundings environment so that it is bearable to exist in it. Recently the group transfixed a gigantic UFO on the spear of a sculpture of Bolesław Chrobry in Wrocław, making him the first Pole who successfully defeated the aliens. Piotr Klonowski. He graduated from the Jagiellonian University in Journalism and Cultural Studies. His works can be found in anthologies: Komiks i jego konteksty, Literatura I kino. Polska po 1989 roku, Kinomitografia nowego milenium and online. Adam Ladziński. Translator, editor, proofreader and recently also always smiling bookseller. Aleksandra Małecka. Linguist, translator, editor at Ha!art. Her main field of interest is translation theory. She translates experimental texts: ancient and modern. During Ha!wangarda festival she is going to talk about her translation of Nick Montfort’s book Round, in Polish – Rondo. Piotr Marecki. Editor, publisher, culture expert. Chairman of the board of Korporacja Ha!art Foundation. He graduated in Polish Philology and Film Studies at the Jagiellonian University, He has a Ph.D. in Cultural Studies at the Jagiellonian University, and is an assistant professor at the Institute of Contemporary Culture, Jagiellonian University. Co-funder and editor-in-chief of “Ha!art” – the interdisciplinary journal focused on new cultural developments (published since 1999), organizer of literary festivals and colloquiums. Nick Montfort. An associate professor of digital media at Massachusetts Institute of Technology, poet, literary critic, digital media theoretician. His research interests lie somewhere between computing and literary practice. Montfort is an author and a programmer of interactive fiction, text generators and other literary devices and books: Twisty Little Passages: An Approach to Interactive Fiction (2009), Racing the Beam: The Atari Video Computer System (2005). He is also an editor of the anthology New Media Reader (2005). Montfort regularly blogs about digital media, writes poems in unusual formats and collaborates with other writers and programmers within the framework of many common literary projects. Anna Nacher, Marek Styrczyński. The creators’ duo behind the Magic Karpaty Project, authors of books, famous also in their professional incarnations (Anna Nacher as a media culture researcher and an associated professor at Institute of Audiovisual Arts at Jagiellonian University, Marek Styczyński as an environmental protection specialist and an etnobotanist). Marcin Nowak Lubecki. He was born in Silesia, currently lives in Warsaw. He was a preschooler, later a pupil until he finally became a student at the Theatre Studies Department at the Theatre Academy in Warsaw. Next, without success, he undertook writing a doctoral dissertation at Graduate School for Social Research,Polish Academy of Sciences. He worked at “Gazeta Wyborcza” culture section, where he was writing book reviews. Since a couple of years he’s a CEO at media agency. In his free time he does nothing, because he wouldn’t like to miss anything. Leszek Onak. A wordmaschine, cyberhobo creator, administrator. Co-producer of wgra volume, author of installations and algorithms. He tapers with a stick in the interface carcass, speaks with bots, and remixes the stick. He is the creator of literary portals: niedoczytania.pl , liternet.pl , and the co-initiator of rise of Rozdzielczość Chleba. Tags: perfocard, cichy nabiau, Websites: http://lonaq.tumblr.com , http://http404.org. Mariusz Pisarski. a researcher in Digital Culture, Author of Xanadu and Hypertextual Methamorphosis of Prose (2013), founder and editor of the “Techsty”journal. The copy editor of the chapbook Michael Joyce. Polish Writer, editor (together with Piotr Marecki) of Literary hypertext. Literature and new media. Translator, producer and promoter of experimental and electronic literature. Magdalena Potrawiak. She graduated in English Philology at Pedagogical University of Cracow. An audiovisual translator, collaborating with the National Film School in Łódź, Krakowskie Biuro Festiwalowe, Korporacja Ha!art and No Sugar Films. Her research is focused on intercultural communication, strategies and methods of culture translation and a role of translator as a mediator. Agnieszka Przybyszewska. She graduated in Polish Philology and Film Studies at University of Łódź. She was a Ministry of Education scholarship holder several times, a laureate of the Czesław Zgorzelski Contest for the best M.A. thesis in Poland. She is currently an assistant professor at the Theory of Literature Department at the Institute of Modern Culture, University of Łódź. Researcher and lover of everything that is non-conventional in literature, especially e-literature, liberature, etc. Her works have been published in “Zagadnienia Rodzajów Literackich”, “Przegląd Kulturoznawczy”, “Teksty Drugie”, “Ha!art” and “Fragile” and in various volumes. This year Przybyszewska is planning to publish a book entitled Liberackość dzieła literackiego. In her private life she is a dancer. Piotr Puldzian Płucienniczak. Postpoet, Pd.D in Sociology, figherfighter adept. He develops the art of disfunction. He has published Marsz na ROM, and submitted “Zbiór pusty” and some other stuff. Kaja Puto. Born in 1990 in Madziolandia. Student of Philosophy and graduate in Film Studies at the Jagiellonian University. She is interested in political philosophy, culture of Austria and modern history of East-Central Europe. Professionally a seawoman, in Ha!art she is a translator, editor, fundraiser and a “stop-gap”. Ewelina Sasin. A Polish Studies graduate, culture expert, guitarist. She collaborates with Cracow’s NGO’s. Her main field of interest is Polish Literature after 1989, relations between literature and music and Arab Culture. She publishes in her free time. Paweł Schreiber. An expert on theatre, an assistant professor at English Philology Department of University of Kazimierz Wielki in Bydgoszcz, professor of Second Generation Humanities at UKW. As a theater critic, he collaborates with journals such as “Didaskalia”, “Teatr” i “Chimera”. Schreiber writes about computer games on blogujawnesny.pl and in “Dwutygodnik” magazine. Sławomir Shuty. An intermedia artist: writer, film director, photographer and performance artist. Author of the books: Nowy Wspaniały Smak (1999), Bełkot (2001), Cukier w normie (2002), Zwał (2004), Produkt Polski (2005), Cukier w normie z ekstrabonusem (2005), Ruchy (2008), Jaszczur (2012) and the Internet novel Blok (www.blok.art.pl). The author of Disco Polo Opera the première of which was held at Łaźnia Nowa Theatre in Cracow in 2003. In 2005 he was awarded the Passport prize of “Polityki” magazine for his novel Zwał. The same novel has also been awarded the title of Cracow Book of the Month. The books Zwał and Cukier w normie were adapted for the stage in the Polish Theatre in Poznań and Łaźnia Nowa Theatre. He was the Ministry of Culture grant holder in 2005 and 2010,and Homines Urbani grant holder in 2008. He wrote the screenplay to Zwał on the basis of his own book, and to Satan Spa directed by Piotr Kielar. Michał Sowiński. Graduated in Polish Philology at Jagiellonian University, currently a doctorial student at Polish Philology Department. In Ha!art deals with different things. Sowiński considers himself as a literary expert (prose lover), sometimes engaged in literary critics. Programme Director of Jan Błoński Festival. Mikołaj Spodaryk. Stuntman of sensitivity, culture expert, graduate of the Institute of Polish Culture, Warsaw University. He is interested in the media aspect of novels. In Ha!art he has recently been made responsible for distribution. Michał Tabaczyński. translator (from English and Slavic Languages), essayist, literary critic. Recently, he has published Widoki na ciemność (Wrocław, 2013): a set of essays and translated J. D. Bolter’s Writing Space: Computers, Hypertext, and the Remediation of Print (with A. Małecka) and E.J Aarseth’s Cybertext. Perspectives on Ergodic Literature (with P. Schreiber). Karolina Wiktor. A visual artist, between 2001–2010 she worked together with Aleksandra Jakubiak in a performative duo called Grupa Sędzia Główny. Selected exhibitions and performances: Rozdział III of 4x performance, BWA Gallery, Zielona Góra, 2002, Telegra, TV program Noc artystów, TVP Kultura, 2005, action Wirus at Magnetyzm serc dir. Grzegorz Jarzyna, Teatr Rozmaitości, 2006, the competition display Glances 2007 – Deutsche Bank Foundation Award, Zachęta, 2007, Być jak sędzia główny, BWA Wrocław, Avant-garde Gallery, 2010. Her works are exhibited in the collections of the National Museum in Warsaw, Zachęta – National Art Gallery, and then Signum Foundation in Poznań. Blogger: www.afazja.blogspot.com and www.poezjawizualna.blogspot.com. She describes her own experience in a poetic biography entitled Wołgą przez Afazję. Jakub Woynarowski. A graduate and a professor of Cracow Academy of Fine Arts. An interdisciplinary artist, designer and independent curator. A co-creator of books on the borders of theory and visual practice: Wunderkamera, Corpus Delicti. Author of the artistic design of the exhibition in the Polish Pavilion at 14th Architecture Biennale in Venice. Bartłomiej Woźniak. Editor, occasionally translator. Admirer of Kafka’s writing and Delta Blues. Justyna Zarudzka. A student at the Institute of Applied Linguistics, Warsaw University, French and English translator, fan of fantasy in every form. Jurij Zawadskij ЮрійЗавадський). The finest representative of modern avant-garde Ukrainian poetry, working in the field of phonetic poetry. He collaborates with the ZSUF Group. The author of 7 volumes of poetry and a promoter of foreign literature in Ukraine. Małgorzata Żarczyńska. The first person in Poland, who dedicated her M.A. thesis to famous Lexus Group and thereby to Paweł Jarodzki – the author of drawings presented during Ha!wangarda festival at Bomba Social Club. She likes art because “only art is not going to trick us”.